Mid December I went on a quick trip to Milan, before heading back home for Christmas. I took many pictures whilst there and Milan is definitely not a city to lack beautiful sights but this one is definitely my favourite. 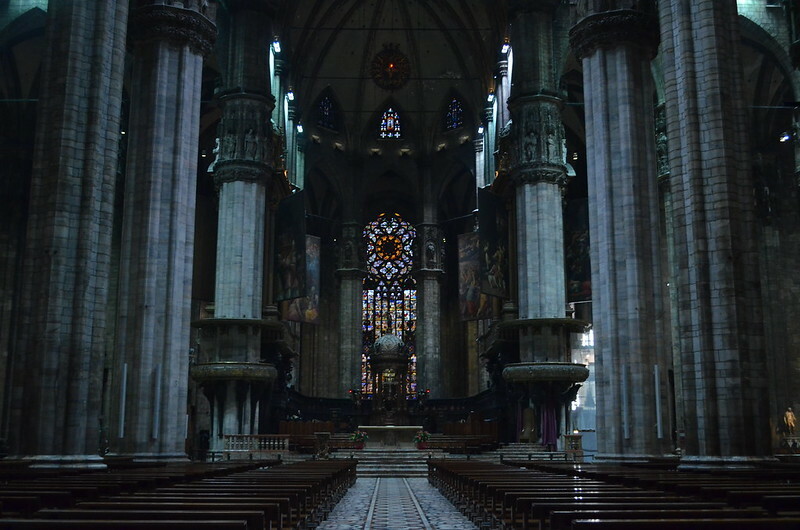 The Duomo is by far Milan’s most representative landmark and it doesn’t disappoint – inside and out. The fact that you could stand halfway across the open space in front of it and see around you showed just how much the rain that day had kept people from venturing outside. As much as the sun can make my day, I’m grateful for the gloomy weather in retrospect, as I got to see the Duomo pretty much to my discretion. It never ceases to amaze me how impressive certain places can be. The Duomo is one of them. Maybe it’s the size, maybe its symbolism, or just the incredibly vivid colours of the stained windows but I don’t think anyone could walk in there and be indifferent (or ‘meh’, to use popular terms).